Newsgur USA: Mesut Özil: "I will not play with Germany while I feel racism"
Mesut Özil: "I will not play with Germany while I feel racism"
Mesut Özil had no qualms about announcing that, at 29, he will not play again for the national team; a message that has convulsed German football. The one who is considered the most talented player of his generation and the cornerstone of the title of Germany in Brazil 2014 was expounded in an extensive statement, divided into three parts, which he shared on Sunday night on his Twitter account, to explain that it is a considered decision as a result of what he has lived in recent months. Mesut Özil's decision to abandon the German national team has caused a political storm in Germany that reaches even the federal government. 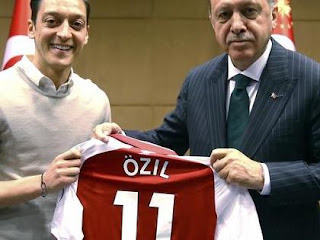 Özil referred to his criticized meeting last May with the President of Turkey, Recep Tayyip Erdogan, the reaction of the press and his sponsors and the action of the German Football Federation (DFB, for its acronym in German), in particularly that of its president, Reinhard Grindel. The organism rejected on Monday the accusations emitted by the player. "The photos with Turkish President Erdogan have raised questions for many people in Germany, and we give a self-criticism that the DFB has also contributed to the treatment of the issue, and it is unfortunate that Mesut Özil felt he had not been sufficiently protected as a target of racist slogans against his person," the DFB said in an article it made public on its website. "We categorically reject that the DFB is associated with racism," said the federation, whose president Reinhard Grindel was accused by the 2014 world champion of Turkish origin. "For many years, the DFB has been very involved in the integration work in Germany," he said. Özil says he has received hate messages after being singled out as one of the main culprits of Germany's failure at the last World Cup in Russia 2018, where the world champion four years ago was eliminated in the first phase after losing to Mexico and South Korea. "I'm German when we win, but I'm an immigrant when we lose," said Özil, who is the grandson of a Turkish immigrant family that settled in Gelsenkirchen in western Germany, the city where he was born in 1988. In addition to the title won in 2014, Özil has played 92 matches for the national team and since 2011 he has been voted five times as the best player of the team by the fans. "It is with great pain and after much consideration that due to the recent events I will not play for Germany while I have this feeling of racism and disrespect," said the player. "I used to wear Germany's shirt with a lot of pride and enthusiasm, but not now, I feel like I'm not wanted and I think what I've achieved since my debut in 2009 has been forgotten," he lamented. In the first part of the statement, Özil refers to his meeting in May with Erdogan at an event in London, which was also attended by Manchester City player Ilkay Gundogan - German of Turkish origin - and Everton's Turkish striker, Cenk Tosun. The three players appear next to the president in a photograph made public by the AK ruling party before the presidential elections that took place in the country at the end of June, which Erdogan won by majority. Many German politicians criticized Özil and Gundogan's loyalty to Germany's democratic values, recalling that Berlin has been very critical of the Turkish government for the persecution suffered by opposition politicians after the failed coup in 2016. Gundogan issued a statement in which he claims to "honor 100% German values" and maintains that he never intended for the photograph to be seen as political support. Özil had not discussed the issue until this Sunday when he made it clear that he has "two hearts, one German, one Turkish." He mentioned that Erdogan also had meetings with Queen Elizabeth II and with the British Prime Minister, Theresa May, and that it was "a lack of respect" to the roots of their ancestors not to have accepted the meeting with the president. "It was not about politics or elections, it was about me respecting the highest official of my family's country," he explained. It is estimated that in Germany there are some three million people of Turkish descent, a fact that is often mentioned in political debates in a country where there is increasing tension due to the growth of immigration and the rise of far-right parties. Özil questions in his statement why others of his team-mates who also have double descent are not treated in the same way. "Is it because I am Turkish? Is it because I am a Muslim? I believe that an important issue is touched here," he stressed. The player openly criticizes different actors related to his life, such as his school, sponsors, press and the governing body of German football for not coming out in his defense and leaving him abandoned before the attacks of which he was publicly targeted. At the center of his outrage is the president of the DFB, Reinhard Grindel. "In the eyes of Grindel and his followers, I am German when we win, but I am an immigrant when we lose," he said, citing links between the leader and the conservative CDU party with a "past of discrimination" that is against multiculturalism. "While I have tried to explain my heritage, my ancestors and the reasons behind the photo, he was more interested in talking about his own political ideologies and belittling my opinion," Özil said.